At the sound of distant splashing, Francis opened his eyes. His face had slowly deformed the mud until it almost seemed a mask in which he might have suffocated. Trying to turn his head, he winced. Somewhere in the night, it seemed, his bones and muscles had fused to become an almost immobile mass. Slowly, painfully, he pulled his arms to his chest and pushed himself up onto his knees. His body wanted to scream but his instincts said he needed to remain silent. His world was a grey cloud. As it often did, a heavy morning fog had settled into the trenches, blurring the lines of reality and imagination, preventing the senses from reaching more than a half-dozen feet in any direction. The light said it was day, but that was where his universe stopped. The splash sounded again, closer. Francis had seconds to debate friend or foe. He opted for safety, launching himself across the gap to the other side of the trench, burying himself behind the remnants of crates. Silence was key. German voices pierced the fog. At least he assumed they were German. He knew Welsh and English, but just enough of the words sounded familiar to suggest he wasn’t hearing French. His heart was ready to explode and he willed his breathing to calm, the rapid exhalations forming eddies in the fog that he was sure would give away his position. From the mists, two boys in German uniforms emerged, poking their rifles into the detritus that lined the trench, presumably looking for food or ammo. They plodded through the puddles, secure in each other’s company, unaware of the din they created. 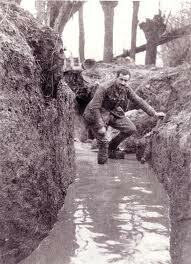 One soldier cried out and attacked the side of the trench. His compatriot turned to find him tugging at the buried corpse. Placing his rifle to one side, he joined the other and between the two of them, they pulled the dead soldier out, the mud protesting their invasion with a loud sucking noise. The first soldier reached inside the dead man’s great coat, feeling around blindly until his hand lighted on his quarry. Smiling at his partner, he extracted a sodden square of leather, teasing apart its folds and sliding out military script. His partner, meanwhile, was filling his pockets with items from the dead man’s kit. Francis watched the vultures loot the corpse, his mind racing to comprehend the incomprehensible. This was one of their own. He was as surprised as the German soldiers when the chest of one caved in at the bullet wound. The recoil of his rifle telling Francis that he had pulled the trigger. By the time the unwounded soldier figured things out and was rising to his feet, he too found himself with a bullet in the chest. He gaped at Francis, who slowly emerged from his hiding place, and his eyes rolled into his head as he fell to his knees and then face down in the mud. Francis shook, bracing himself against the crates lest he too collapse into the puddle. The dead soldiers—the men he had killed—lay at his feet. Francis tried to feel anguish at his crime. He tried to feel joy at his survival. He felt nothing. Not cold. Not wet. Not even numb. His world had closed in on him, smothering him. This was the first time Francis had fired in battle, all previous conflicts amounting to little more than scurrying from trench to trench, fox hole to fox hole, keeping you head low lest it be removed. The first time Francis had taken a human life, and yet he was intrigued that he felt no different than had he just slaughtered a hog for its meat or put down a rabid dog. Francis dragged the soldiers onto their drowned comrade, laying their rifles next to them. He then stood silently, scanning the air for any sound, the splash of footsteps racing to the rifle shots. He heard nothing. He pulled aside the coat of one soldier to find a filthy uniform underneath, not just torn in places but the material actually rotting away. A photo dangled precariously from the soldier’s pocket. He retrieved it and saw a youth, the soldier, standing in front of a portly woman near a well. He wondered if this was the boy’s mother. Flipping it over, the back was inscribed with German. Without knowing why, Francis pocketed the photo and rose to his feet. As he lifted and flipped over the soldier’s military kit, he was startled by the rumble of artillery in the mists far ahead. The line had apparently moved in the night. Time to rejoin his unit. Shouldering the German kit and his rifle, Francis stepped over the fallen soldiers, picked his way past the puddles and dissolved into the mists. Two months ago, while organizing my grandmother’s things after her funeral, I found an ancient, moth-eaten bag in her attic. Opening it, I discovered a German bible and a mixture of English and German war rations, as well as a photograph of a boy and his mother. The back was inscribed in German, which I asked a neighbour to translate for me. No name. No date. Just a message of love and worry. That my great-grandfather had his kit and photo suggested the boy did not make it home and his mother’s heart broke. I keep the photo with me as a constant reminder of the sacrifices made on both sides. Sacrifices that let me lead the life I do. Please note: This story is a fiction, although my great-grandfather Francis Sowden did serve in the first World War. This entry was posted in Short stories and tagged choices, commemoration, destiny, pain, Remembrance Day, short story, soldier, survival, war, World War I, writing. Bookmark the permalink.